So nestle in folks. Today we'll go over how exactly to make a tincture demonstrating with the mighty elderberry. What the Heck is a Tincture? Before we start I might as well address this if you are baffled by the word tincture. Basically a tincture is an herb macerated in alcohol or glycerin with plant material strained off after six weeks. What's left are the medicinal properties of the herb suspended in the alcohol or glycerin. This liquid is then administered from an amber glass bottle that contain a pipet with drop doses placed underneath the tongue. Why not? If you haven't been in the natural foods section of your nearest grocery store you haven't then seen the enormous variety of elderberry products available. 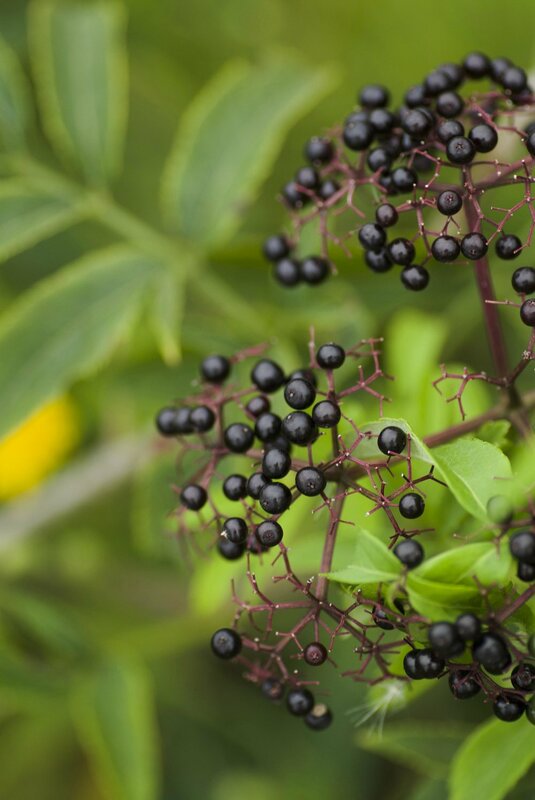 Elderberries have been quite the buzz in the natural world to help prevent colds and flus. Even more exciting there are actually biomedical studies to back this information up. Below I've put together a few rescources to get you started in understanding just how good elderberries are for our immune systems. For our purposes today we will be making an alcohol tincture using vodka. This is my standard way to make a tincture. Below is a guide to the standard types of tinctures you can make. Ratios are super important in making a tincture. This is a pretty standard ratio guide. Make sure to pay attention to whether you are using fresh or dried plant material. This makes a different in your proportions. There are certain plants that can be more potent and require less material. The info below is strictly a guide. Consult with a knowledgeable herbalist for specific plants and how to tincture. them. Seek out your plants and give thanks and ASK them if you may harvest them! Gratitude to the earth and plants! Harvest your plant/bark/flower material into your tincture vessel tearing (if plant material) into 1” sized pieces. Note: If using bark you will carve off twig material. If using root you will harvest root, chop into 1” pieces and leave to dry overnight—proceeding with step 3 the following morning. Pack in your plant material and cover the entire material with alcohol. Note: Sometimes the plant material will absorb more of the alcohol than you had though…this requires checking on your tincture after a few days to top off the jar. Above all make sure ALL the material is covered with alcohol top of the container. Place in a dark cool location and leave to macerate for 6 weeks. fresh elderberries (you can use dry you'll just use half the amount of berries called for in the recipe. Take your mason jar and fill lightly packed with elderberries with 1/4 inch room from the top of the container. Cover the berries with your vodka or alcohol of choice. Note: Sometimes the plant material will absorb more of the alcohol than you had thought…this requires checking on your tincture after a few days to top off the jar. Above all make sure ALL the material is covered with alcohol top of the container. This is the part where you pour off the plant material to get the medicinal value of the plant suspended in the alcohal. Don't forget this part! Place the empty container in a bowl and place a piece of cheese cloth that will successfully hold all the material that is macerating in the alcohol. Set aside cheese cloth with plant material and screw on the cover…make sure to transfer your label from the original container to the new container so you know what tincture you have! Discard the remaining plant material from the cheese cloth in a safe place. Do NOT throw it away. Composting it in a special corner of a garden and making sure to give thanks to the plant is IMPORTANT! Gladstar, Rosemary. Medicinal Herbs: A Beginner’s Guide: 33 Healing Herbs to Know, Grow and Use. Storey Publishing. 2012. Hoffman. David. Holistic Herbal: A Safe and Practical Guide to Making and Using Herbal Remedies. Thorsons. 2003. Note: Mad props to Kristine Leuze for the lovely black and white photo. (She's also the wizardress behind all the amazing photos on my website's header pages.) Check her out here if you need an amazing photographer in central Minnesota! This web site — Urban Nettle — is for general health information only. This web site is not to be used as a substitute for medical advice, diagnosis or treatment of any health condition or problem. Users of this web site should not rely on information provided on this web site for their own health problems. Any questions regarding your own health should be addressed to your own physician or other healthcare provider. Urban Nettle makes no warranties nor express or implied representations whatsoever regarding the accuracy, completeness, timeliness, comparative or controversial nature, or usefulness of any information contained or referenced on this web site. Urban Nettle does not assume any risk whatsoever for your use of this website or the information contained herein. Health-related information changes frequently and therefore information contained on this web site may be outdated, incomplete or incorrect. Statements made about products have not been evaluated by the Food and Drug Administration. Use of this web site does not create an expressed or implied physician-patient relationship. Urban Nettle does not record specific website user information and does not contact users of this website. You are hereby advised to consult with a physician or other professional health-care provider prior to making any decisions, or undertaking any actions or not undertaking any actions related to any health care problem or issue you might have at any time, now or in the future. In using this website you agree that neither Urban Nettle nor any other party is or will be liable or otherwise responsible for any decision made or any action taken or any action not taken due to your use of any information presented at this website.